On the banks of Lake Norman, just outside of Charlotte, North Carolina, you’ll find William Amos Hough High School – home of Iditarod Motorsports. Just like the small-town feel of their hometown Cornelius, the Iditarod Motorsports team is a tight-knit group of students, and more importantly, friends. Students graduating from Bailey Middle School didn’t want to leave the fun of competing in the Ten80 National STEM League (NSL) behind. 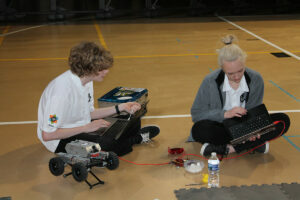 They were determined to spread their middle school experiences and love of STEM to the high school level. 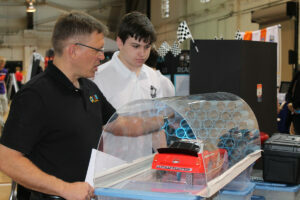 Passing the reins to their peers on Horsepower Motorsports, they ventured off to William Amos Hough High School with a plan. With the support of Brock Shipley, CTE Technology Education teacher, the students established a Student Racing club at the high school – and thus Iditarod Motorsports was born. Shipley was elated to help them create a place for students passionate about STEM to put their knowledge and skills to the test. 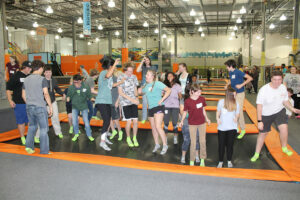 Now in its fourth year, students meet twice a week; once during the school day for a 45-minute enrichment period and once afterschool for 1-hour. 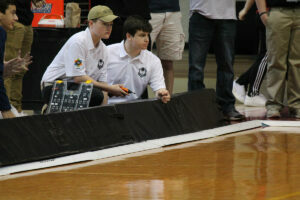 Throughout the year, students break into small teams of 2 to 3 people to complete each project. Once a group has completed a project, they assist others to help everyone finish on time. “The most challenging aspect of Ten80 is having the students set project checkpoints to make sure they meet all deadlines in time,” shared Shipley. But, under his positive leadership, these students learn the value of teamwork and develop strong communication and collaboration skills while successfully navigating project planning and management. Three years later, the club is stronger than ever. 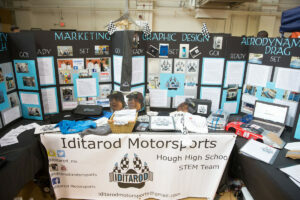 Iditarod Motorsports has grown to include more than 20 students, both male and female from each grade level, which make up 1 Racing Challenge team and 1 Rover Challenge team. Students competing on Iditarod Racing own a motorsports team and their ultimate goal is to engineer performance of a 1:10 scale electric radio-controlled (RC) car. Students participating on the Iditarod Rover team use open source software and hardware to optimize code and design a Rover robot to autonomously navigate courses paralleling real life operations in remote areas of land, sea, and space. Learning to work collaboratively as a team is one of the greatest long-term benefits of Ten80. 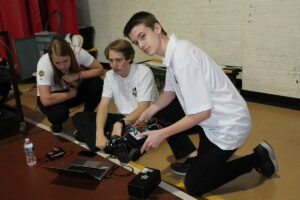 During the 2017-18 academic year, STEM students at William Amos Hough High School practiced driving and repairing their racecars, coded an autonomous rover and robocar, engaged in data driven design to improve both vehicles, dabbled in clean energy and aerodynamic projects while continuing to build their team brand through logo development, creating marketing materials and community outreach. 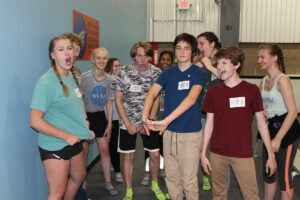 Integrating collaboration and competition into their STEM program, Iditarod Motorsports competed and won the regional NSL competition held near Columbia, South Carolina. Having won an invitation to the NSL Finals, the team traveled to Rensselaer Polytechnic Institute (RPI) in Troy, New York in April. The weekend of April 28-29, 2017, students found the Alumni Sports and Recreation Center at RPI, better known as the Armory, abuzz with STEM activity. 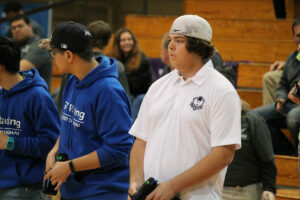 During the two-day NSL Finals competition, students apply math and science knowledge in practical, creative ways. Iditarod Motorsports found themselves competing against dozens of teams and hundreds of students from across the country and three teams from China. After a hard-fought battle, Iditarod Motorsports sprung up victorious taking home first place in Racing, second place in both Rover and Graphic Design, and the crème de la crème, 2018 Grand Champion crown.